Latest post Fri, Dec 7 2018 2:09 PM by George Angeludis. 5 replies. I'm just beginning to get a handle on MC's title tool options, having produced most of my graphics exertnally with other applications. Until last week, selecting the Title Tool using the tools menu gave me the option of choosing between the simple Avid Title Tool or Marquee (or New Blue Title Pro, which was greyed out). I seem to have checked some "remember this choice" box when opeing the Title Tool, and I no longer get the option to choose - how do I restore this? - I want to try Marquee but retain the option of either. There is no setting for Title Tool in the settings menu, and the "T" button on the top of the timeline window invokes only the prompt "Please Install New Blue Titler Pro" Supposing that new Blue was not installed, I tried to run an installation (which I had on my server but canh'øt remember where it came from) and this opened a Windows MSI windows with the instructions in Russian Cyrillic text - I did try but I don't know if it got installed. I certainly cannot find evidence of this applicatiojn in any of my Windows folders. Can anyone enlighten me on any of the above? Thanks! Go to the SETTINGS tab in the Project window. Search for TITLE TOOL (or just press T on the keyboard to get it faster) and double click on it. A window pops up were you can set it up like you want. Thanks Ivan - but my point was that that was the choice which had disappeared - but further experimentation showed that the setting to offer the option is in the settings menu under Marquee Title - I have restored it. let´s talk about New Blue Fx. But I still haven't found out what New Blue Titler Pro is (or where to download it and how to install it). 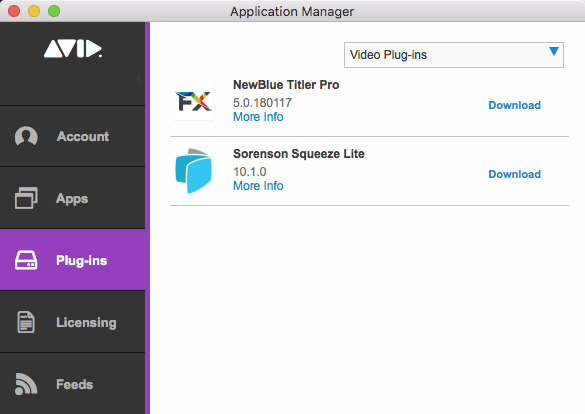 You can download NewBlue Titler Pro from the Avid Application Manager. It's on the the Plug-ins tab. I would go for the 2018.12 with the new Title Tool which is coming end of December.